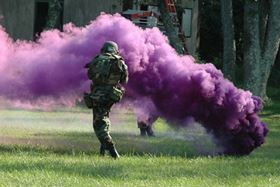 This cloaking grenade, used for hiding troop operations from view on the battlefield, employs nanoparticles that reflect a particular color of light based on their exact size and composition. New work by MIT researchers provides a way to predict the light-scattering properties of layered nanoparticles – or to design nanoparticles to match a desired type of light-scattering behavior. Photo: US Air Force, Tech. Sgt. Scott T. Sturkol, from Wikipedia. A new technique developed by physicists at Massachusetts Institute of Technology (MIT) could someday provide a way to custom-design multi-layered nanoparticles with desired properties, for potential use in displays, cloaking systems or biomedical devices. It may also help physicists tackle a variety of thorny research problems, in ways that could in some cases be orders of magnitude faster than existing methods. Their technique uses computational neural networks, a form of artificial intelligence, to ‘learn’ how a nanoparticle's structure affects its behavior, in this case the way it scatters different colors of light, based on thousands of training examples. Then, having learned the relationship, the program can essentially be run backward to design a particle with a desired set of light-scattering properties – a process called inverse design. The findings are reported in a paper in Science Advances by MIT senior John Peurifoy, research affiliate Yichen Shen, graduate student Li Jing, professor of physics Marin Soljacic, and five others. Soljacic says the goal was to look at neural networks, a field that has seen a lot of progress and generated excitement in recent years, to see "whether we can use some of those techniques in order to help us in our physics research. So basically, are computers 'intelligent' enough so that they can do some more intelligent tasks in helping us understand and work with some physical systems?" To test the idea, the physicists used a relatively simple physical system. "In order to understand which techniques are suitable and to understand the limits and how to best use them, we [used the neural network] on one particular system for nanophotonics, a system of spherically concentric nanoparticles," explains Shen. The nanoparticles are layered like an onion, but each layer is made of a different material and has a different thickness. The nanoparticles have sizes comparable to the wavelengths of visible light or smaller, and the way light of different colors is scattered by these particles depends on the details of these layers and on the wavelength of the incoming beam. Calculating all these effects for nanoparticles with many layers can be an intensive computational task for many-layered nanoparticles, and the complexity gets worse as the number of layers grows. The researchers wanted to see if a neural network would be able to predict the way a new particle would scatter colors of light – not just by interpolating between known examples, but by actually figuring out some underlying pattern that would allow the neural network to extrapolate. "The simulations are very exact, so when you compare these with experiments they all reproduce each other point-by-point," says Peurifoy, who will be an MIT doctoral student next year. "But they are numerically quite intensive, so it takes quite some time. What we want to see here is, if we show a bunch of examples of these particles – many, many different particles – to a neural network, whether the neural network can develop 'intuition' for it." Sure enough, the neural network was able to predict reasonably well the exact pattern of a graph of light scattering versus wavelength – not perfectly, but very close, and in much less time. The neural network simulations "now are much faster than the exact simulations," Jing says. "So now you could use a neural network instead of a real simulation, and it would give you a fairly accurate prediction. But it came with a price, and the price was that we had to first train the neural network, and in order to do that we had to produce a large number of examples." Once the network is trained, though, any future simulations would get the full benefit of the speed-up, making it a useful tool for situations requiring repeated simulations. But the real goal of the project was to learn about the methodology, not just this particular application. "One of the main reasons why we were interested in this particular system was for us to understand these techniques, rather than just to simulate nanoparticles," Soljacic says. The next step was to essentially run the program in reverse, to use a set of desired scattering properties as the starting point and see if the neural network could then work out the exact combination of nanoparticle layers needed to realize those properties. "The initial motivation we had to do this was to set up a general toolbox that any generally well-educated person who isn't an expert in photonics can use. ... That was our original motivation, and it clearly works pretty well for this particular case," says Shen. The speed-up in certain kinds of inverse design simulations can be quite significant. "It's difficult to have apples-to-apples exact comparisons, but you can effectively say that you have gains on the order of hundreds of times," says Peurifoy. "So the gain is very, very substantial – in some cases it goes from days down to minutes."